Though the natural constitution of man entirely unfits him for remaining under water with safety for more than a few moments, the desire of obtaining valuable articles lying at the bottom of the sea, as well as the necessity for the execution of certain manual operations in civil engineering, has led him to devise numerous expedients by which he is enabled to lengthen his continuance at moderate depths. It has been said that the pearl clivers of Ceylon can remain under water six minutes, but this is hardly credible; and Admiral Hood, who took pains to time their diving, found that they were under water in no instance more than a minute. The instance narrated by Dr. Halley of a Florida Indian diver at Bermuda, who could remain two minutes under water, is regarded as an extreme case. In Franchere's "Narrative of a Voyage to the N. W. Coast of America," mention is made of the feats of diving of the Hawaiian islanders. Two of them were induced to go down in 14 fathoms of water in search of two sheaves lost overboard. They went down several times, each time bringing up shells as a proof that they had been to the bottom. "We had the curiosity to hold our watches while they dove, and were astonished to find that they remained four minutes under the water. That exertion appeared to me, however, to fatigue them a great deal, to such a degree that the blood streamed from their nostrils and ears. At last one of them brought up the sheaves, and received the promised recompense, which consisted of four yards of cotton." Statements are made by others which render it probable that the time may be somewhat extended beyond that observed by Admiral Hood, or even by Dr. Halley. The lungs retain at each ordinary expiration considerable carbonic acid. By breathing deeply for a short time the quantity is lessened, and the blood becomes more than usually aerated and capable of performing its functions for a longer time than usual without renovation. It is told of Brunei that, wishing to examine a break in the Thames tunnel, he was lowered with another person in a diving bell to the depth of 30 ft., and the brake not permitting the bell to descend further, he dived into the water, holding a rope in his hand. He found no great difficulty in continuing under water fully two minutes, which is explained by the circumstance that the air in his lungs had been condensed in the bell to but little more than half its ordinary bulk, and therefore was capable of supplying much more oxygen. The pressure exerted by the water is not only felt in the lungs but upon all parts of the body to a sensible degree. At a depth of 17 ft. it amounts to about 7c1/2 lbs. to every square inch of surface, and increases about 0.44 of a pound with every additional foot of depth. - To enable the diver to stay a considerable time under water, a dress called a diving armor is now generally employed for the laying of foundations and attaching apparatus for raising sunken vessels, and also by pearl and coral divers. Such a one is now (1874) in use in the construction of the foundations of the piers at the Battery in New York harbor. The diving dress or armor consists of a copper helmet, shown in fig. 1, tinned inside, and supplied with thick glass windows, and a copper breastplate which has a collar, to which the helmet is readily adjusted. The helmet is large enough for considerable rotation and lateral motion of the head, and allows the air which is forced into it to be so diffused as to be breathed without inconvenience. The breastplate permits a free expansion of the lungs and sufficient motion to avoid constraint of the muscles. To the lower part of it is attached an India-rubber dress, having a' body, legs, and arms; shoes are fitted on, and the whole is impervious to water. The central window of the helmet can be readily removed without removing the helmet. Leaden weights are attached to the waist and soles of the shoes to enable the diver easily to maintain an erect position when standing or walking upon the bottom. A pump, shown in fig. 2, which is usually supplied with three cylinders, forces air through a flexible but strong India-rubber tube into an opening in the back of the helmet, which leads through a flat channel to the frontal portion, where it is delivered against the glass windows, thus serving not only to supply the lungs of the diver, but to clear the moisture from the inner surface of the windows. The air finds its exit also at the back of the helmet. The air from the pump is free to pass down the waist and into the legs, between the person and the dress, and is delivered with sufficient force to overcome slightly the hydrostatic pressure. Fig. 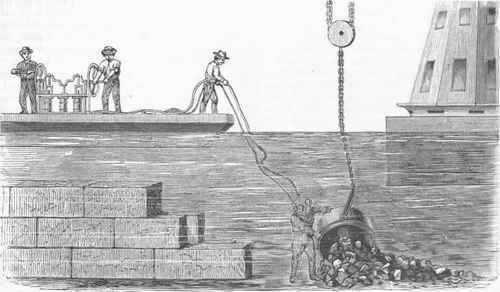 2 represents the diver in the act of spreading a large bucket of hydraulic concrete upon the bed of a harbor, preparatory to laying blocks for the foundations of a pier. A signal rope communicates with an attendant on a boat which contains the air pump. The signals of the diver are communicated verbally by the attendant to a director stationed upon the derrick by which the buckets of concrete or blocks of beton are moved into position, and by him bells are rung which enable the attendant at the engine to execute the necessary movements. In 1856 Mr. E. P. Harrington of Westfield, N. Y., recovered the iron safe of the steamer. Atlantic, sunk four years previously in Lake Erie in about 170 ft. of water. The safe itself was at the depth of 157 ft. He used a common flexible India-rubber armor, unprotected with metal, and supplied with air sent down from a pump through a tube of 3/8-inch bore, composed of nine alternate layers of canvas and rubber, with a copper wire coiled inside to prevent collapse. He also wore shoes of lead, and carried weights of lead amounting in all to 248 lbs. His first descent was on June 19, and the 18th and last was on the 22d, when he succeeded in attaching a line to the safe, which was in a state roomon the upper deck, and it was hauled up. The time of his remaining below increased from one minute at the first descent to 11 minutes at the last. At the depth of 50 to 70 ft. all light disappeared. He suffered from extreme chilliness; his strength too, he thought, was diminished nine tenths. The pressure sometimes caused a violent rush of blood to the head, and the appearance of bright flashes like electrical sparks. Fig. 1. - The Diver. FiG. 2. - The Diver spreading Concrete.